I love experimenting with all types of foods and lately have really been enjoying vegan items and recipes. I am experimenting more and more with vegan cooking & baking so more recipes will be coming your way!! 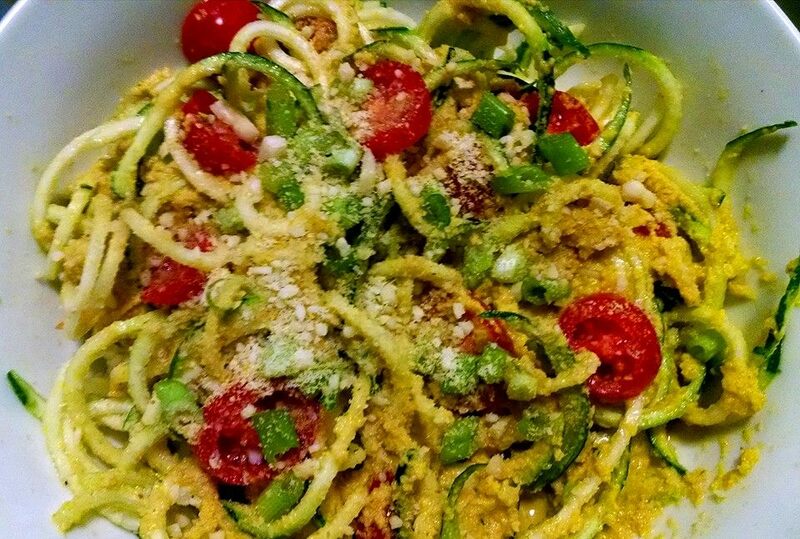 This was very simple & quick to make; in fact the part that took the longest was twisting the zucchinis through my spiralizer (noodle-maker for veggies…if you don’t have one, GET ONE!!). The sauce; about 1 minute, tops!!! I know you are going to love this!! We ate ours cold, but I think it would also be amazing hot…which would take away the “raw” aspect, but hey, vegan is kick-a%$ all by itself 🙂 I think next time I will eat it hot, myself, in fact! In a high-speed blender, combine all the sauce ingredients and blend until smooth (you can add more water if too thick). Add more salt, to taste, if desired. Pour over the zucchini, tomatoes, and scallions in a large bowl and toss to combine. If desired, top with vegan parm and/or extra chopped walnuts. Experiment with various nuts, herbs, & oils!!! Carrots go well with so many flavors your options are endless!! Get creative and have fun!!! Heck, while we are being creative, try using parsnips instead of carrots. Posted on May 6, 2014 by OregonKitchenPosted in VeganTagged dairy-free, fast dinner, fast meal, fast meals, fresh meals, fresh pasta, gluten-free, healthy dinner, healthy meals, quick, raw, vegan, vegan pasta, vegetarian pasta, veggie pasta, veggies, zucchini pasta.